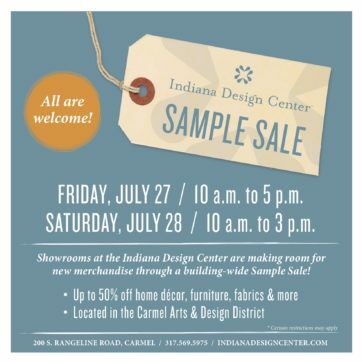 Save the Date for the last weekend in July, Friday, July 27 from 10 a.m. to 5 p.m. and Saturday, July 28 from 10 a.m. to 3 p.m., for the IDC’s annual Sample Sale. Shop designer brand furniture, accessories, electronics, tile, art and more at discount prices throughout the building in IDC showrooms. Find bargains on a variety of items that must go to make room for fall merchandise. Shop early for the best selection. In addition to the showroom sales, a space will be dedicated to a Designer Sale Room in suite 120-B on the first floor where individual designers have special sample sale items on sale for purchase. Bring your design dilemmas for a mini Designer On Call appointment! A designer will be on staff from 11 a.m. to 1 p.m. for complimentary 15-minute design consultations. Bring photos of your project and design inspiration for on-the-spot advice.